Delta and United are viewed by some as potential candidates to fly the A380, but to date they have shown no interest. ATLANTA ( TheStreet) -- Three U.S. carriers are also the world's three biggest airlines -- United ( UAL - Get Report), Delta ( DAL - Get Report) and American ( AMR - Get Report) -- but little indication exists that any of them have any particular desire to fly the world's biggest passenger airplane. Four years after the introduction of the Airbus A380, which can carry up to 600 passengers, 49 aircraft are flying for six international airlines, and orders have been placed by a total of 18 airlines. None are based in the U.S. Moreover, no U.S. carrier seems close to purchasing the A380, although Airbus spokesman Clay McConnell said that "eventually you will see some U.S. airlines order it." So far, the A380 has defied skeptics,, to the point that its story no longer revolves around doubts and questions, but rather around what destination will be the next to gain service. The destinations don't currently include Atlanta, Charlotte, Chicago, Dallas, Houston or Newark, where U.S. carriers operate their principal hubs. Rather, the U.S. airports with A380 service are all international gateways served by foreign carriers with hubs on the opposite side of the Atlantic or Pacific. These airports include Los Angeles, Miami, New York (Kennedy), San Francisco and Washington Dulles. The U.S. carriers, "prefer frequency over size," said aviation consultant Scott Hamilton. In their hubs, several times each day, dozens of airplanes fly in, exchange passengers and fly out, and the carriers often prefer to serve international destinations more than once a day -- or they simply don't have enough passengers to a given destination to fly an A380. "When I look at the current crop of managers, the guys running airlines in the U.S. today, they don't appear to be the kind of people who manage their businesses to have bigger airplanes," added Avondale Partners analyst Bob McAdoo. "Instead, they want to manage smaller airplanes and more frequencies to their hubs." In any case, it seems clear that only two U.S. carriers, Delta and United, are potential 380 customers, because they are the only two operating super large aircraft -- Boeing 747s -- today. Also, both fleets include both Airbus and Boeing ( BA - Get Report) jets, unlike American, which is all Boeing. Hamilton said the A380 is most useful at congested international airports, such as London Heathrow and Tokyo Narita, with vast numbers of passengers and limited slot availability. Since both Delta and United serve both airports, either or both could be evaluating the aircraft, he said. Both carriers declined to comment on potential aircraft orders. 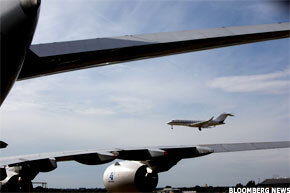 McAdoo said that over time, U.S. carriers have reduced their 747 use in favor of smaller aircraft like the 777. He said while the 747 is often used on flights to Narita, where passengers connect to points throughout Asia, newer, smaller aircraft including the 787 mean that those passengers, going forward, will be able to bypass Narita, reducing demand for the A380. Still, even today, U.S. carriers routinely sell tickets on the A380 and put their passengers on them, and five U.S. airports already have A380 service. To the extent that competitors could gain an advantage by achieving lower passenger costs on the A380, this is mitigated because many of A380 flights to the U.S. operate under joint ventures with U.S. partners. Delta, for instance, code shares on Korean A380 flights from Seoul to both Narita and Hong Kong; additionally, an Air France flight between Paris and Washington Dulles is part of the two carriers' transatlantic joint venture, with revenue split according to a formula established by the carriers. A curiosity of A380 usage so far is that some route selection is counter-intuitive. Instead of flying to partner United's hub in Chicago, Lufthansa flies to competitor American's hub in Miami. Instead of flying to partner Delta's hub in Atlanta, AirFrance flies to competitor United's hub at Dulles. Also, Air France flies a Paris/Montreal route, something few experts expected because Montreal is a relatively small city. Lufthansa spokesman Martin Riecken said it's probably a little early to draw conclusions on A380 usage. 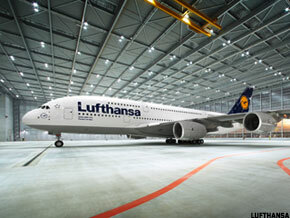 For Lufthansa, he said, "this is just the beginning -- we have taken delivery of seven out of 15 A380s." Other U.S. cities could be in the mix in the future, he indicated. Lufthansa currently serves 17 U.S. cities. As far as Lufthansa's choice of Miami as a destination, Lufthansa formerly flew a 747 on the Frankfurt-Miami route. "It was always oversold, more or less," Riecken said. "This was a perfect opportunity to increase capacity without a second flight." By contrast, on the Frankfurt-Dulles route, Lufthansa already has two daily flights on a 747 and an A340. "It would be hard to put in an additional 200 seats," Riecken said, even though United, Lufthansa's partner in a transatlantic joint venture that enables revenue sharing, has a Dulles hub. AirFrance, however, was willing to try it, even without a partner in Dulles, because it was flying three widebodies between Paris and Dulles. Now it has just two flights, one on a 777 and one on the A380, but a similar amount of capacity. In the case of AirFrance, McConnell said, the A 380 brought obvious efficiencies. "The A380 is difficult to compete against," he said. "It's extremely popular -- it gets a revenue premium -- and it is cost efficient to operate."